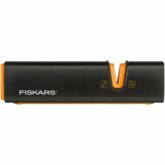 Fiskars next generation chopping axes serve all manner of woodwork, chopping, carpentry and pruning. The range delivers a beautiful package of minimalist design and sharp-edged functionality with the right fit for all wood preparation tasks. Pick your size according to the task at hand. 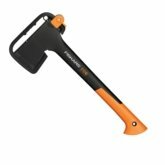 The Universal Chopping Axes thin, wide edged blades ensure a clean, easy cut in fresh, resinous wood, like spruce or pine. 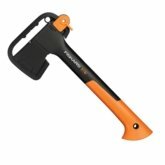 Chopping Axe XXS-X5 is suitable for kindling small wood for a campfire. The belt clip and small size make it handy to carry even on your waist. Great and very versatile tool to replace larger knife when trekking.